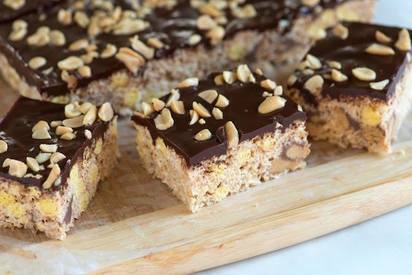 Chocolate reeses rice krispie treats! If there’s one combination of flavors that is historical, it’s chocolate and peanut butter. In it’s honor, we spruced up Rice Krispie Treats with big chunks of Reese’s candy and a shiny chocolate glaze. We added Kix cereal, too, which is bigger and crunchy for just a hint of extra texture. These babies didn’t last long, not long at all.